I began studying the accordion at the age of eleven at the Italian Music Learning Center of S. Vincenzo La Costa (Cosenza), under the direction of Maestro Lucio Cortese. My musical growth is enhanced by a number of national and international competitions, the results of which see me ranked between 1st and 2nd place. But the initial classical training leaves soon the place to a true passion for jazz that began to take shape in the collaboration with the “Imperfect Jazz Quartet”, together with the drummer Manolito Cortese . In 2002, therefore, he takes up the study of jazz music at the Institute ” Voglia D’Arte ” at Roseto degli Abruzzi (Te) in the wake of Maestro Renzo Ruggieri. It’s here that begins a new period of intense critical study aimed to investigate the most intimate expressive reasons of the accordion as an instrument of “art” . The classic study remains the basis of his training which translates today into an eclecticism that led him to express himself through various genres: from rock to ethnic and especially to jazz, embracing the music in its various expressions thanks to an instrument, the accordion, which has long since passed the historic role of folk or classical instrument to establish itself in the totality of musical genres and styles. His concert activity aims to promote new literature of experimental heritage of contemporary music. Since 2002 he lives in Rome where he meets and collaborates with a range of artistic figures of broad spectrum: professionals of theater and music scene operating for a long time in the roman scenery where the musical and artistic ferment is in continuous enrichment thanks to the metropolitan “uropean mittle” breath that feeds and amplifies the Italian cultural scene with a “wave” of internationality. As a theatre-musician, in 2002 , he participates in the performances , ” Nudo ad occhi chiusi ” at the Teatro Valle and Teatro dell’Orologio in Rome, directed by Riccardo Cavallo and music by Stefano De Meo. The show, in which the narrative rhythm alternates to the music of the late Romantic smoky Parisian bistros, traces the “decadent ” life of A. Modigliani. From his debut onwards the concert activity and theater and cinema composition alternates recursively. It is with the irreverent ” Salomè ” directed by Gianni De Feo , with Marina Occhiena and Howard Ray, that follows the scene for a show in which the musical becomes pocket and horror gives way to irony and the grotesque. In July 2003 he took part in the competition for jazz accordionists in the city of Morro D’oro ( Teramo), ranking in third place. 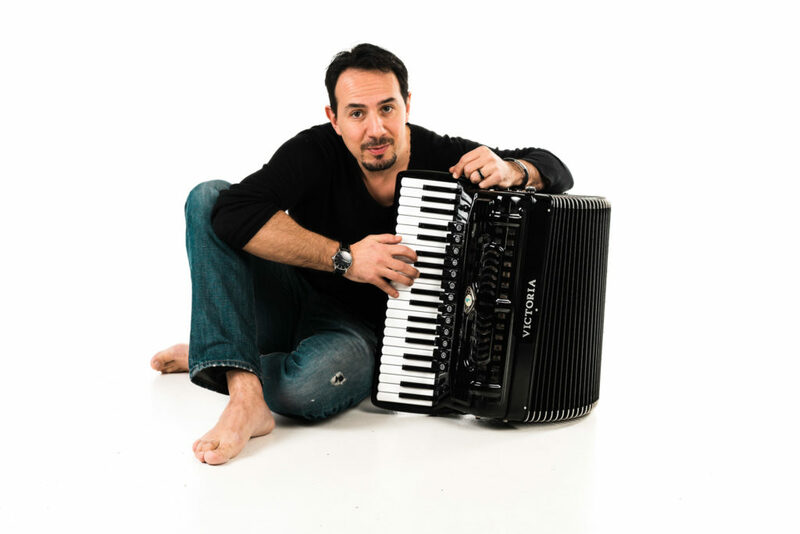 He takes part in the first stage of jazz / modern music held by Maestro Renzo Ruggieri promoted by the Accademia Musicale Voglia D’Arte, the Master Class of Maestro F. Deschamps accordion teacher at the Paris Conservatoire and the Master Class of Maestro Richard Galliano. the play ” Fiori nel cielo”, directed by Ilaria Testoni . He collaborates also with Rein , folk rock band , in the edition of three musical projects that are realized in the release of ” Est “, ” Ballate di fine inverno “, ” Occidente” . Winner of “Bari in jazz 2008” with the trio Di Marco- Palermo- Ceccacci and award Italy Award 2009 Jazz category , toggles a concert career to that of composer and performer with increasing intensity and evolution. He edited in Rome the artistic direction of the historic Roman jazz club “Bebop Jazz Club” . “Quello che prende gli schiaffi ” directed by Glauco Mauri . His concert and creative activity continues in an increasingly eclectic and expressive way. He plays and composes the piece “Magara” for the short film “Cenere eri” (2006), writing Fabrizio Vecchi and directed by Daniele Grassetti. Performers: Remo Remotti, Anna Ammirati, Alessio Caruso. The movie goes on the air on LA7, inside of “La 25a ora”, and won the prize Flabby Face in the competition Cortocittà – Udine – and gain the award for Best Actor (Richard Cavallo) to Videoclip Festival – Turin. The following year, the short film will be selected at the Circuito Off , Venice International Short Film Festival – Venice. He records soundtracks for the films “Tentativi d’amore” (2007) directed by Gianni Leonetti and “Piede di Dio” (2008), the debut of director Louis Sardiello with music by Andrea Terrinoni. Participate as an interpreter in the commercial for the company TOD’S Italy (2008), directed by Dennis Hopper, starring Gwyneth Paltrow.